Martin Luther King Jr was one of the most prominent advocates of the Civil Rights movement during the 1960s. 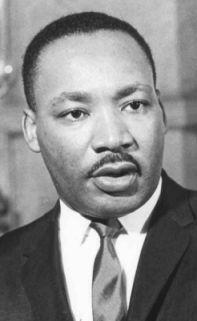 In contrast to some civil rights activists Martin Luther King generally promoted a non-violent strategy of social change. (This policy of non-violent resistence drew inspiration from similar campaigns by M.Gandhiin India’s Independnce struggle. Martin Luther King, Jr. was born in Atlanta on 15 January 1929. Both his father and grandfather were pastors in an African-American Baptist church, King would also later follow them into the ministry. M.Luther King attended Morehouse College in Atlanta, (segregated schooling) and then went to study at Crozer Theological Seminary in Pennsylvania and Boston University. It was at University that King became more aware of the civil rights struggle and he took the opportunity to study Mahatma Gandhi’s non-violent strategy for social change. In 1953 King married Coretta Scott, who herself had many artistic and intellectual talents. The following year King became pastor at Dexter Avenue Baptist Church in Montgomery, Alabama. A defining moment in the civil rights struggle was to a large degree instigated by M.Luther King who was the president of the Montgomery Improvement Association. It began on 5 December 1955, when Rosa Parks a civil rights activist refused to given up her seat breaking the strict segregation on Montgomery’s buses. King inspired black residents to launch a bus boycott which lasted well into 1956, this gained substantial media coverage and in Dec of the following year the United States Supreme Court declared the segregation unconstitutional and the buses were desegregated. Following the success of this action the civil rights movement gained strength. King and other minister founded the Southern Christian Leadership Conference (SCLC) in 1957. There was often disagreement about how to proceed with different groups pursuing different strategies. This split would become more significant in the 1960 with substantial disagreements with groups such as Black Power and Malcom X’ Black Nationalist groups. Martin Luther King was one of the world’s greatest orator. His deep and powerful voice was able to captivate audiences. His speeches caused him to become one of the most well known civil rights leaders. In 1963 he was named as Time’s man of the Year. It was in August of 1963 that King delivered his famous and iconic I have a Dream Speech. The speech was given at the Lincoln Memorial in Washington D.C during the 250,000 march for civil rights. However his opposition to the Vietnam War in the later part of the 1960s caused friction and strained relations with the Johnson administration. It also led the FBI to seek to undermine King’s leadership. In April 1968 Martin Luther King delivered his final address “I’ve Been to the Mountaintop”whilst supporting striking sanitation workers in Memphis, The next day, 4 April 1968, King was assassinated. To this day, King remains a potent symbol of the African American civil rights movement. His speeches offer a striking exposition of some of the ideals of the civil rights movement.